Day 01: Arrival in Kathmandu (Int. Tribhuban airport), (1400m.) Transfer to Hotel. Flying to Kathmandu along the northern border of Nepal on a clear day is in itself an exciting and memorable experience as exotic panoramic view of snow-capped Annapurna mountain range peaks before you. We will meet you at the airport. Day 02: Trip preparations day in Kathmandu (1400m.). Day 03: In the morning (45 min.) fly to Lukla (2800m.) and trek start to Chutanga. (3200m.) Apx. hrs. walk. Overnight at teahouse lodge. We take an early morning flight to Lukla. During the flight, we can bask in the mesmerizing views of giant snow-capped mountain peaks. We then head eastwards from Lukla. The trail crisscrosses through pristine hamlets and thick forest along Kalo Himal Ridge. We must stay aligned with our specific route. Otherwise, we may deviate from the target destination. At the time of winter, snow makes us transverse steep terrain. But during favorable climatic condition, the trail is usually straightforward. After 3-4 hours of trekking, we enter Chutanga. Day 04: Commence Trek from Chutanga to Thuli-Kharkha, (4300m.) via, cross over the Zwatrla Pass. (4500m.) apx. 5 hrs. walk. 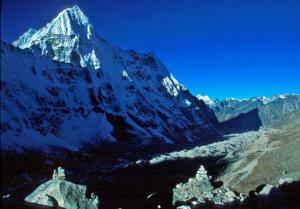 The trail crosses the Kalo Himal Ridge which separates the Khumbu from the Hinku Valley. Further ahead, we transverse a comfortable path showcasing a cairned notch on the ridge with a collection of prayer flags at an elevation of 4450m. En route we may encounter yak herders. The views across the Dudh Kosi towards Karyolung and the Lumding Himal are very impressive and so is the view across the rolling foothills east of the Hinku Valley. Half an hour below the pass is a huge boulder which marks our campsite, Tuli Kharka. 6 to 7 hours of trekking finally take us to Tuli Kharka. Day 05: Commence Trek to Kothe (3600m.) apx. 5-6 hrs. walk. The trail descends the rock-strewn path leading to a fine vantage point of the Hinku valley where mesmerizing views of the south face of Mera Peak become visible. The trail zigzags through forested areas and then descends steeply into the Hinku valley. Enchanting panorama of Peak 43 and Kusum Kangguru unfolds as we bask in the splendor of nature surrounding us from the Hinku Valley. We experience the most exotic and delightful feelings as we walk past forests of pine and rhododendron. Soon after reaching Mosum Kharka, we set a campsite by the banks of Hinku Drangka [river]. Day 06: Commence Trek to Thaknak (4325m.) apx. 5 hrs. walk. As we head to the west bank of the Hinku Khola northwards, forest blurs in and valley zooms out. We spot meadows being used as grazing areas for goats, sheep and yaks in the Upper Hinku. After several ascents for 4-6 hours, we approach summer settlement of Tangnag as we cross a single-plank bridge at Gondishung. We halt for lunch at this spot. Lying in its vicinity is 200 year-old gompa resting beneath a massive boulder and a number of crude mani walls. We utilize two days getting completely acclimatized. After proper rest, we can explore other adventure possibilities like strolling by Sabal Tsho, beautiful moraine-dammed lake which is hidden behind the Sabal Glacier and climbing a peak up to an altitude of nearly 5000m. We can also explore Hinku Nup Glacier which leads north toward Kangtaiga. The upper Hinku valley turns to the east at Tangnag, crossing the moraine of the Dig Glaciers. Day 08: Commence Trek to Khare (5015m.) apx. 4 hrs. walk. As we walk away from Tangnag, the trail ascends to a wide grassy basin, popularly called Dig Kharka. We continue walking for hours. After a while, we arrive at Khare. There are many campsites at Khare and the most popular one is at the upper end of Khare lying beneath a group of boulders. We choose this site for camping. This campsite offers splendid vistas of huge north face of Mera, Hinku Shar Glacier and Mera La. 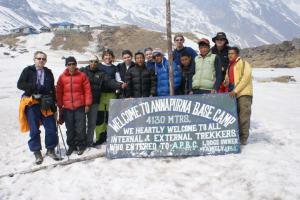 Day 09: Hiking & Explorations day at Khare and training day by Climbing Shrepa. Overnight at Khare (5015m.). We use this day for acclimatization. After proper rest, we take a walk up to a small peak on the west side of the Hinku Nup Glacier, where we can reach a height of around 5500m. At this point, we get to capture stunning views of Mera La and Mera Peak. 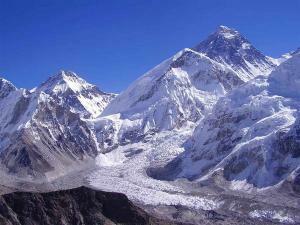 This day we will fully preparing for climbing by get pre climbing training by Climbing Sherpa. Day 10: Commence Trek to High-Camp (5800m.). apx. 4-5 hrs. walk. Overnight at tent camp. We follow the trail leading to Mera La. We continue transversing as far as the lowest part of the Hinku Nup Glacier. At this point, we get captivated by the exotic beauty of snow-slope and the panorama of Himalayan peaks. Day 11: Climbing start early in the morning to summit Mera Peak (6471m.) and same day back to Khare. (5015m.) apx. 9 hrs. walk. Early in the morning at around 3 am after breakfast, we advance towards the summit. By sunrise we can reach up to 6000m. With Incessant attempts, we finally scale the summit. From the summit, we can embrace the most spectacular view of at least five of the world's fourteen 8000m peaks. Most of this spectacular panorama can be seen from the site of the high camp and all of it is visible from 6000m. After the climb, we descend to the campsite on the Hongu side of the pass. Day 12: Commence trek down to Kothe (3600m.) apx. 5 hrs. Day 13: Commence Trek to Thuli-Kharkha (4300m.) apx. 6 hrs. Day 14: Commence Trek to Lukla (2800m.) Cross over via Zwatrla pass (4500m.) apx. 6 hrs. walk. Day 15: In the morning fly back to Kathmandu (1400m.). Day 16: Rest/Shopping day in Kathmandu (1400m.). Day 17: In last. Minute drop to airport back to your homeland.